KFI AM 640 is a broadcast radio station in Los Angeles, California, United States, providing News, Talk, Sports and Traffic programming. KFI was born in 1922 when Earle C. Anthony set up a homemade 50-watt radio transmitter in his garage and started broadcasting at 640AM. 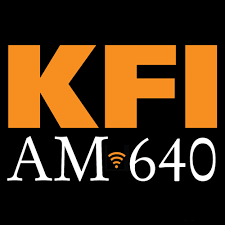 KFI AM 640 became one of the most popular radio stations in Los Angeles and one of the most listened-to news/talk radio stations in the country. KFI (640 kHz) is an AM radio station in Los Angeles, California, owned and operated by iHeartMedia, Inc. It received its license to operate on March 31, 1922 and began operating on April 16, 1922, and after a succession of power increases, became one of the United States’ first high-powered, “clear-channel” stations. KFI is a Class A 50,000 watt station. It airs a talk radio format, with mostly local hosts and frequent news updates. Its studios are located in Burbank between the Warner Bros. Studios and The Burbank Studios, and it has a transmitter site in La Mirada near the Artesia Boulevard exit of Interstate 5, the Santa Ana Freeway. By day, its signal can be heard around Southern California and at night, when radio waves travel further, it can be picked up around Western North America.